Flash Boys by Michael Lewis was a really detailed look at high-frequency trading in the financial markets and a disquieting read due to in the types of predatory activity taking place at the expense of average investors. The book begins with a description of a fiber cable line run between stock market locations in Chicago and New Jersey and how the speed of the line would enable millisecond advantages in receiving financial data for those paying to access the line. This speed advantage, how money can be made off, and how it's advantage can be mitigated was covered by Lewis in part through the story of Brad Katsuyama, beginning with his experiences as a New York-based trader for Royal Bank of Canada. Katsuyama started with RBC in 2002 and in 2006 began to notice trouble buying stocks, as prices would bump up between the time he would begin and then complete transactions. What was occurring is a concept known as front-running, where people (through a speed advantage) would figure out what investors were trying to do and then make money off it. High-frequency traders in a span of milliseconds were seeing that a buyer for a given stock was out there, then purchasing it themselves to drive up the price and selling it at a profit to people like Katsuyama and investors he would purchase on behalf of. Lewis details in the book how this unfair advantage for high-frequency or high-speed traders has been enabled due to new market parameters such as multiple stock exchanges that receive buy or sell signals at slightly different times, dark pools within a given financial institution where stock transactions can occur with notice only going to the institution or those who pay to access information within the dark pool, traders paying for co-location close to trading sites to get a speed advantage, fees and kickbacks to exchanges for buy or sell orders, and multitudes of different trade types (particularly "flash orders" that aren't really orders, just fake market signals) utilized by high-frequency traders to suss out information on what's going to occur so they can then get in front of the intentions of investors who don't enjoy the same speed advantage. Covered in Flash Boys is how Katsuyama after seeing the market predation that was occurring sought to educate others in the industry on it and then created a new stock exchange to try to limit the amount of market advantage enjoyed by high-speed high-frequency traders and have buying and selling of stocked be based on actual company valuations and investor intention. The new stock exchange is IEX and some of the particulars around trading on it include a limited number of order types and no co-location for the purpose of speed along with requiring where firms could connect with the exchange so no speed advantage would exist. IEX opened on October 25, 2013 and on December 19 Goldman Sachs became the first large investment bank to show it's agreement with the principles of IBX by sending a huge volume of trades to them. One interesting thing about Goldman doing this is Lewis in the book also tells the story of Sergey Aleynikov, a former Goldman staffer who was arrested in 2009 for stealing Goldman code, but really appears to have done little wrong, other than show in a way the limitations of Goldman in high-frequency trading. 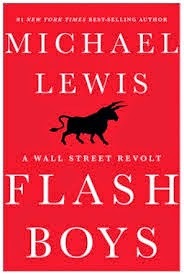 It's a fascinating book by Lewis that was covered by 60 Minutes around the time of its publication and recently written about in The Guardian as having triggered political attention (or at least public statements about paying attention) to needed regulatory changes around high-speed trading and front-running activities.